A trip off the island for the BOC AGM saw me making the long haul down the country to Sandwich Bay Bird Observatory, so it would have been rude not to have made the most of it with some birding as I went. 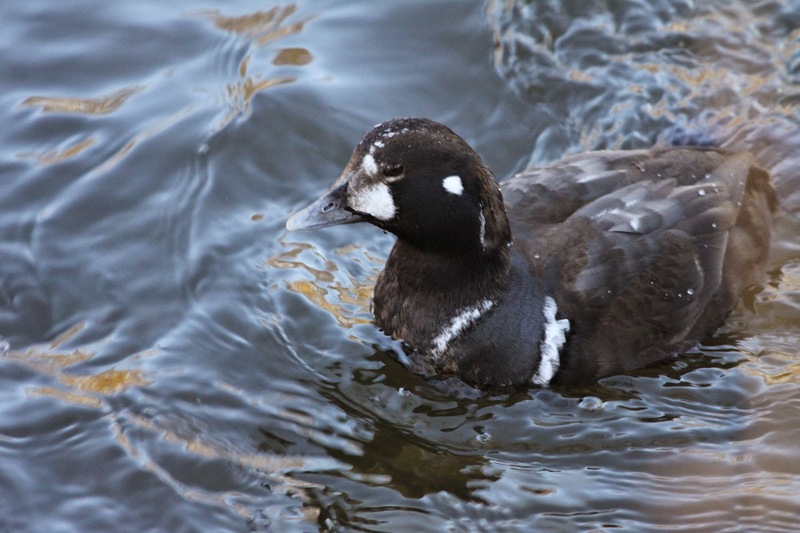 Although it was nice to catch up on a few species that are unlikely to make it to Fair Isle (Tawny Owl, Pheasant, Green Woodpecker etc) it was also a good chance to call in on a couple of lingering rare ducks (and catch up with family and friends of course!). Sadly, I also made it to the Stadium of Light, but we'll skip over that one for now. The BOC meeting was interesting, it was a good chance to catch up with representatives of other Observatories and the BTO and share experiences of our work and thanks to SBBO for being excellent hosts. Not much was happening bird-wise as I left Fair Isle (the snow gradually melted over three days or so), so I was fairly relaxed about being off the island and was even more pleased when I met up with David Steel (heading up to his new role on the Isle of May) and we picked up the Black Scoter off Cheswick in Northumberland (and fish and chips in Seahouses). 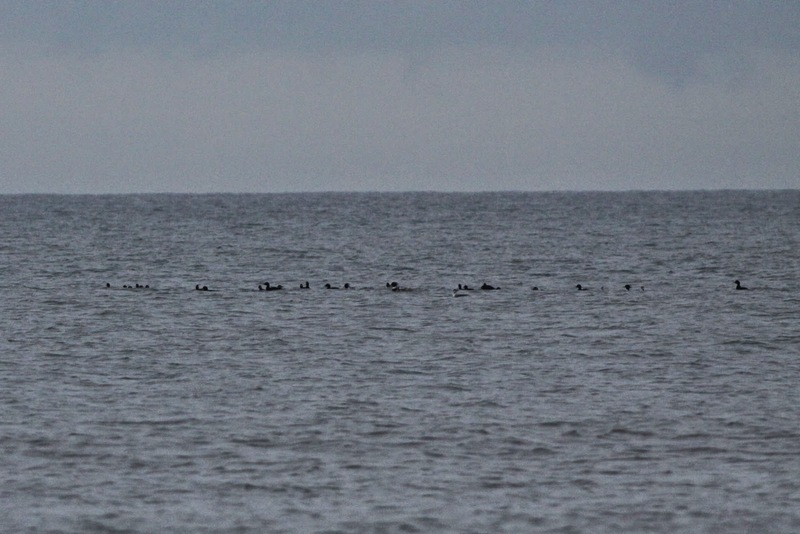 Rather fortunately, the sea was fairly flat calm and, although the bulk of the Common Scoter flock soon drifted out to quite a distance, a small group remained closer in. 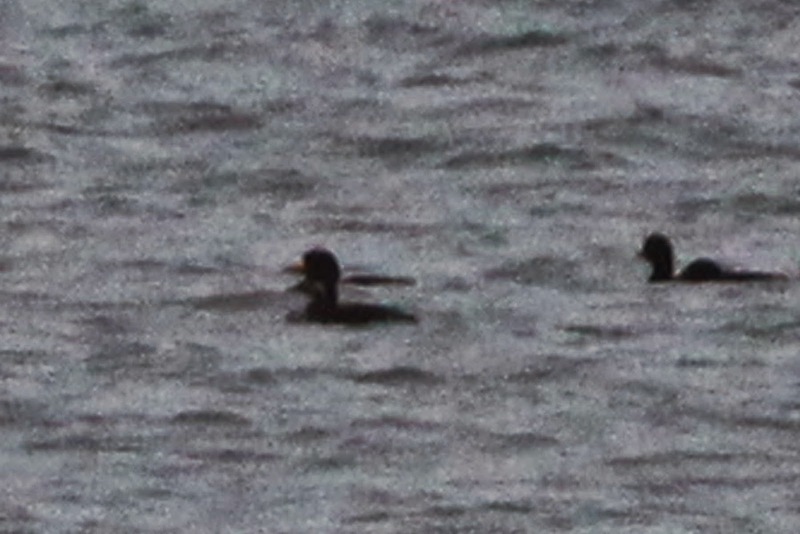 This group contained the Black Scoter, as well as Red-breasted Mergansers, Red-throated Diver and a couple of Slavonian Grebes (all of which are technically visible in this photo). Although it was a very distinctive bird when viewed through the scope (butterbill being a great name for the male of the species), the distant meant that views through the camera were not as convincing. I think this is it! The journey back saw me in Aberdeen on a glorious sunny day, with around six hours to spare, so a walk up to Donmouth to finally get a crack at the Harlequin seemed the obvious choice. After a brief period where it was hiding from view (although Dipper, Kingfisher, Goosander and other species were good to see), I met the finder of the bird, who told me where to stand to expect a view. 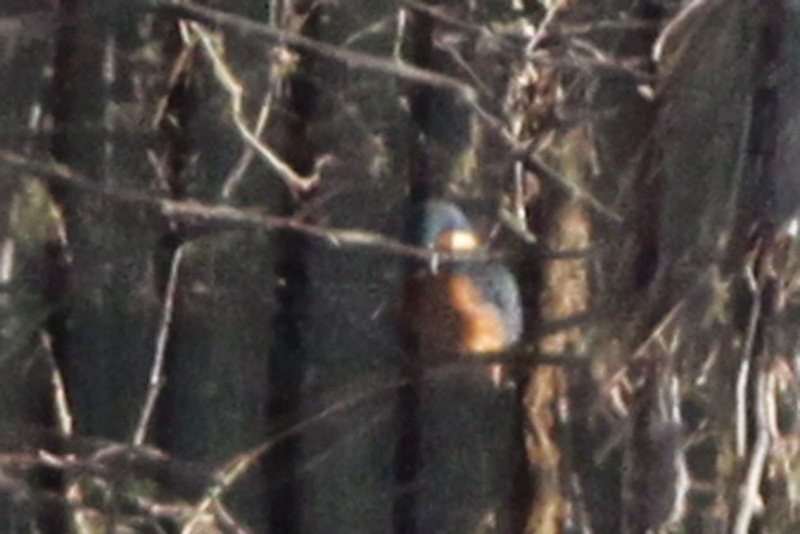 A distant Kingfisher through a fence - a rarer bird on Fair Isle than Harlequin! 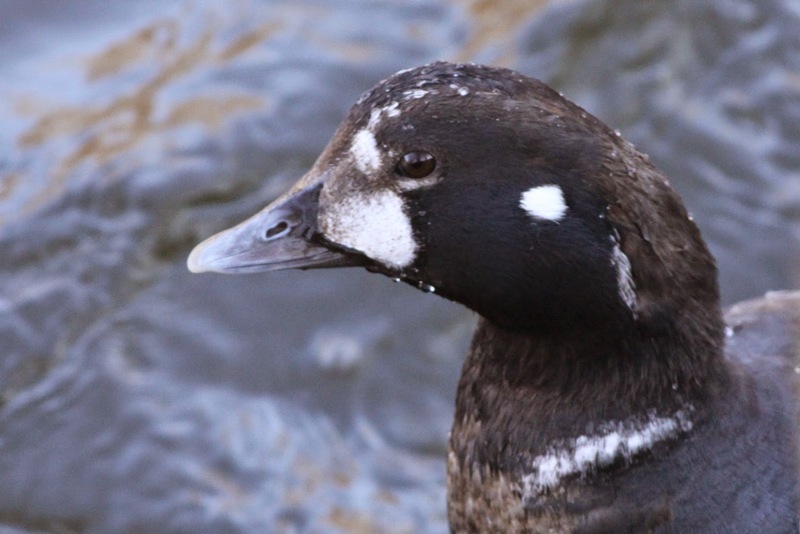 Within a minute, a dumpy duck [it's more Micky than Niall (harle)Quinn] had flown up the river and landed alongside us! 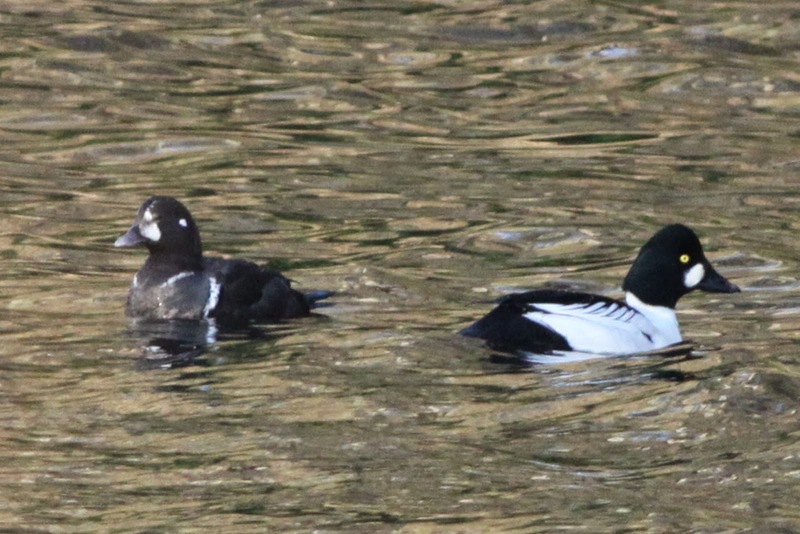 Harlequin in the company of a Goldeneye. It eventually swam to the riverbank then came back towards us, where it sat on a barrel in the river about four metres away! With a 400mm lens, it was pretty difficult to get the whole bird in view as this uncropped image shows! What a great bird! Anyway, after a day where we almost flew back to Fair Isle, but then didn't, I eventually arrived home in time for a little flurry of new arrivals for the year as SSE winds encouraged birds to get on the move. Oystercatcher numbers have built up to at least 36. A Ringed Plover on 13th was followed by a Hen Harrier the following day (the first winter record since 1997) then Woodpigeon and Red-breasted Merganser on 16th, whilst this morning has seen a flock of four Chaffinch in the Obs garden. There's nothing like getting excited over a Woodpigeon to remind you of what it's like birding in the Northern Isles in winter! Chaffinches are often one of the earliest migrants, but this is an early date for birds to be moving through (although small numbers are not unusual as overwintering birds). There are a few daffodils in the garden, new birds coming through and the deadline for staff applications coming up at the end of the week, it's starting to feel distinctly sort of spring-like. 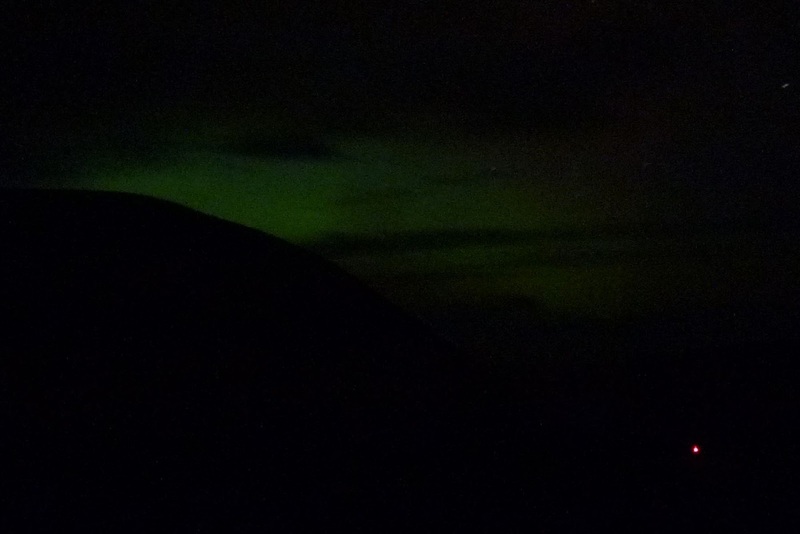 A wonderful aurora last night wasn't matched by the quality of my photos, but it was nice to get back to the family and have the bonus of Northern Lights and birds coming through. Wonderful post and gorgeous photos. Thank you so much for sharing. Warm greetings from Montreal, Canada. you flagrant twitcher, Mr P!!! ..though i might well have done the same! Yes Kath, yes I am! Although in fairness, both of them were less out of my way than a journey from Ellon to Strathbeg (and I twitched that a few times! ).